Craig began his EMS career by attending EMT school in 2007. Craig graduated Paramedic school in 2010 and joined Pafford Medical Services in rural Mississippi the summer of that same year. Always a team player, Craig emerged as a team leader among his peers. He serves as the Field Training Officer for Pafford’s Bolivar County, Mississippi operation as well as assists with QA for the Pafford Delta Division’s participation in the Mississippi Trauma System. As Craig grew in his position, he wanted to do more and became a CPR instructor as well as an ACLS instructor. 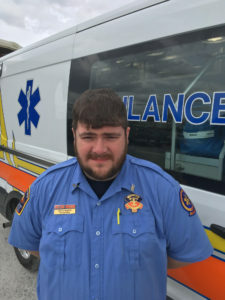 This did not satisfy Craig’s thirst to provide others with the knowledge of this great profession and in 2016 he became an EMT Instructor at Coahoma Community College. Craig and the other EMT Instructor at the school have enjoyed great success with excellent pass rates. Craig is a loyal, productive, and dynamic employee as well as a humble community servant. Craig has served on the front lines for Pafford, having been deployed to hurricane responses on the Louisiana Coast as well as flood evacuations in Mississippi. Fellow employees know they can depend on Craig Sparks to lend a helping hand no matter what they need. Craig’s compassion for his fellow man, whether on the clock or off, is demonstrated in everything he does. Craig always puts service over self to ensure that his patients get the care that they deserve. Pafford Medical Services of Mississippi is proud to nominate Craig Sparks as an American Ambulance Association 2017 Star of Life.